John Jonah Jameson, Jr. is a fictional character appearing in American comic books published by Marvel Comics, commonly in association with the superhero Spider-Man. The character was created by writer Stan Lee and artist Steve Ditko, and he first appeared in The Amazing Spider-Man #1 (March 1963). Jameson is typically depicted as the publisher or editor-in-chief of the Daily Bugle, a fictional New York newspaper. 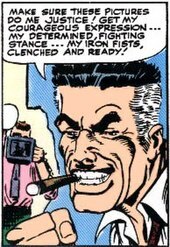 Recognizable by his toothbrush moustache, flattop haircut, and ever-present cigar, he carries out a smear campaign against Spider-Man. He employs photojournalist Peter Parker, who, unbeknownst to Jameson, is Spider-Man himself. Portrayals of Jameson have varied throughout the years. Sometimes he is shown as a foolishly stubborn and pompous skinflint who micromanages his employees and resents Spider-Man out of jealousy. Other writers have portrayed him more humanly, as a humorously obnoxious yet caring boss who nevertheless has shown great bravery and integrity in the face of the assorted villains with which the Bugle comes into contact, and whose campaign against Spider-Man comes more from fear of youngsters following his example. In either case, he has remained an important part of the Spider-Man mythos. Jameson is also the father of John Jameson, the Marvel Universe supporting character who, in addition to his job as a famous astronaut, has become Man-Wolf and Star-God. As a result of his father's wedding to May Parker, Jameson and Peter Parker are related by marriage. Academy Award-winning actor J. K. Simmons portrayed the character in Sam Raimi's Spider-Man trilogy, as well as voicing him in various additional works such as The Avengers: Earth's Mightiest Heroes, Avengers Assemble, Ultimate Spider-Man, Lego Marvel Super Heroes: Maximum Overload and Hulk and the Agents of S.M.A.S.H.. Created by writer Stan Lee and artist Steve Ditko, Jameson first appeared in The Amazing Spider-Man #1 (March 1963). Stan Lee stated in an interview on Talk of the Nation that he modeled J. Jonah Jameson as a much grumpier version of himself. Later Spider-Man writers Tom DeFalco and Gerry Conway agreed that J. Jonah Jameson was as close as Lee ever came to a self-portrayal, with Conway elaborating that "just like Stan is a very complex and interesting guy who both has a tremendously charismatic part of himself and is an honestly decent guy who cares about people, he also has this incredible ability to go immediately to shallow. Just, BOOM, right to shallow. And that's Jameson." Conway stated that whenever he wrote Jameson's dialogue, he would hear it in Lee's voice, and on one occasion even wrote a Jameson speech that was almost directly quoted from a Stan Lee speech. The Spider-Man creative staff considered Jameson's wedding to Marla Madison in Amazing Spider-Man Annual #18 (1984) a momentous enough event that they asked Stan Lee to script the story, while the art team on the issue emulated Steve Ditko's style. Jameson has been a mainstay of the Spider-Man supporting cast, and on a few rare occasions has been given a starring role, including Peter Parker, the Spectacular Spider-Man #80 (July 1983), Web of Spider-Man #52 (July 1989) (in which Spider-Man himself only appears in a single panel), and Spider-Man's Tangled Web #20 (January 2003). According to "Behind the Mustache", a story featured in Spider-Man's Tangled Web #20 (January 2003), Jameson was raised as a child by David and Betty Jameson. David was an officer of the United States Army, a war veteran decorated as a hero; at home, however, David regularly abused his wife and son. As a result, J. Jonah Jameson grew convinced that "No one's a hero every day of the week" and "Even the real heroes can't keep it up all the time." Later issues of The Amazing Spider-Man clarified that David Jameson was in fact Jonah's foster father, and the brother of J. Jonah Jameson Sr., Jonah's biological father, who had to leave his son behind for undisclosed reasons. It is unknown if Jameson Jr. remembered him. He was a Boy Scout during his childhood. In high school, his interests were mainly boxing and photography. He met his first wife, Joan, when they both joined their high school's photo club. When the school's three top athletes started bullying him, he fought back and beat all three of them to a pulp. This impressed Joan, and they started dating. They married as soon as they finished school. After school, Jameson sought employment as a journalist. In Marvels #1, a young reporter brags to his colleagues that he would one day run the Daily Bugle; according to writer Kurt Busiek, he and artist Alex Ross intended this to be J. Jonah Jameson, but the editor of the Spider-Man line objected that Jameson was too young to have been alive during the early 1940s, when the story was set. Since it was too late to redraw the scene, the editor settled for having Jameson's name removed from the issue. When the U.S.A. joined World War II in 1941, Jameson served as a war correspondent in Europe. Sergeant Fury and His Howling Commandos #110 featured him as covering a mission of Sergeant Nicholas Fury, who was heading a team of commandos during the war. After the war, he and Joan had a son, John Jonah III, who grew up to become an astronaut. When Jameson returned from a journalistic mission in Korea, he was grieved to find that his wife had died in a mugging incident. Focusing on his professional life to dull the pain, he was promoted to chief editor of the Daily Bugle, and eventually came to own the paper, thereby fulfilling his earlier boasts. Jameson gained a mostly deserved reputation for journalistic integrity, but his greedy opportunism and unyielding belligerent stubbornness made him more than a few enemies. Due to real-world time advancement Jameson's war-time experiences have since either been ignored or retconned. This episode sets a pattern with Jameson's and Spider-Man's relationship: Jameson publicly accusing Spider-Man of numerous crimes and misdeeds, only to feel continually obliged to print almost as many retractions after being proven wrong. The lead story of the following issue, Amazing Spider-Man #2 (May 1963), sets another part of the pattern: Peter Parker selling pictures of himself as Spider-Man to the Bugle with few questions asked, and Jonah using the pictures to support his editorials against Spider-Man, unaware that he is giving him gainful employment in the process. After his accusations that Spider-Man is the notorious criminal overlord The Big Man are debunked, Jameson admits that he is jealous of Spider-Man's courage and selflessness. Jameson believes that he cannot look at himself as a good man while a hero like Spider-Man exists. Despite this, he openly idolizes Captain America, and Mary Jane Watson-Parker has suggested that Jameson hates Spider-Man mainly because he acts outside the law. A psychiatrist suggests that it is the mask that bothers him, and that when Jameson sees people who "claimed to be heroes, but covered their faces", he is subconsciously sure that they're hiding a horrible secret like his foster father was. While interviewing Spider-Man, Jameson says that he used to think that he was jealous, or worried about children endangering themselves by following the hero's example, but says that the mask is why he dislikes Spider-Man. Though Jonah's rancor against Spider-Man at times subsides after he saves the life of one of his loved ones, his determination to find some flaw in the hero always returns before long. For his part, Spider-Man's reaction ranges from frustration and anger at the ungrateful publisher, which leads to occasional pranks to antagonize him, to an amused acceptance of his self-destructive stubbornness. Jameson posts rewards for Spider-Man's capture or secret identity, hunts him with Spencer Smythe's Spider-Slayer robots, and even commissions superpowered agents to defeat the masked man. He hires a private detective named MacDonald Gargan, puts him through a regimen of genetic enhancement, and transforms him into the Scorpion - only to have Gargan go insane and turn on his benefactor. Although Spider-Man protects Jameson from the Scorpion, Jameson keeps his role in creating the Scorpion secret for years. He creates another superbeing, who turned into a supervillain, the Human Fly, who had his own vendetta against him. He hires Silver Sable and her Wild Pack to hunt Spider-Man down, and also hires Luke Cage to capture Spider-Man when he is wanted for the deaths of Gwen Stacy and Norman Osborn. On another occasion, he offers Electro a five-thousand-dollar reward (1970 dollars, worth $19,300.00 today) to mount a surprise attack against Spider-Man during a television interview. Though best known for his crusades against vigilante superheroes like Spider-Man, Jameson never hesitates to use the power of his paper against supervillains, crooked politicians, and crime bosses, including the Kingpin. (In fact, the Kingpin's attempt to silence Jameson, and Spider-Man's attempt to rescue him, are central plot-elements in the Kingpin's very first appearance.) After initially supporting Sam Bullitt, a candidate for New York Attorney General who had pledged to arrest Spider-Man if elected, Jameson reverses his stance after learning that Bullitt is a racist crook. He publishes a major exposé on mayoral candidate Randolf Cherryh's criminal ties, acknowledging in advance that a retaliatory lawsuit from Cherryh could bankrupt the Daily Bugle. Jameson later takes an aggressive stance against presidential candidate Graydon Creed, attacking him for his anti-mutant agenda and investigating the shadowy Operation: Zero Tolerance, though he never manages to uncover the truth. In Amazing Spider-Man #162 (November 1976), Jameson introduces himself to Dr. Marla Madison, a distinguished scientist and daughter of a deceased friend of his. He asks for her help in creating a new Spider-Slayer, one of a series of robots created to defeat Spider-Man, although Spider-Man has managed to survive their attacks and destroy each of them. Madison is interested in the challenge, and joins Jameson in his efforts. The two grow closer, eventually marrying but not without another attack from the Scorpion, who kidnaps Marla and is defeated by Spider-Man. Jameson remains a devoted, if a little overprotective, husband to his second wife. Marla Madison adopts Mattie Franklin, her niece and the daughter of one of Jonah's friends. Though Jonah is initially opposed to having a roguish teenager in his house, especially one who insists on affectionately calling him "Unca Jonah", he soon warms up to Mattie, coming to regard her almost as a surrogate daughter. Two weeks after Mattie is abducted for illegal harvesting of mutant growth hormone, private investigators Jessica Drew and Jessica Jones track her down and inform Jonah and Marla that Mattie is also the vigilante Spider-Woman. For saving Mattie, Jonah heavily promotes Jones' agency and later hires her as a reporter for the Bugle's new Pulse magazine. The guilt for creating the Scorpion catches up with Jameson when the Hobgoblin blackmails him about it. When he receives the threats, rather than succumb to the Hobgoblin, Jameson chooses instead to reveal it to the world in a public editorial. He steps down as the Bugle's editor-in-chief, delegating the post to his immediate subordinate, Joseph "Robbie" Robertson, but Jameson remains its publisher. Jonah's control of the Daily Bugle is bought out from under him by multimillionaire Thomas Fireheart. Fireheart had felt that he owed Spider-Man a debt of honor and in an attempt to repay the hero, he purchases the Daily Bugle[volume & issue needed] and begins a pro-Spider-Man campaign. Jameson starts up a rival magazine which continues to produce anti-Spider-Man articles. [volume & issue needed] Spider-Man finds Fireheart's campaign embarrassing at best, and after he repeatedly demands that he stop, Fireheart challenges the web-slinger to a battle to the death in New Mexico. He then sells the Bugle back to Jameson for the sum of one dollar, on the condition that he print an obituary "For either me, or Spider-Man." Jameson, though shocked by the request, takes the deal. He is blackmailed into selling the Bugle to Norman Osborn after threats were made against his family; simultaneously, he is attacked and hounded by the supervillain Mad Jack. The time spent as a subordinate to Osborn took a heavy mental toll, almost driving him to attempted murder, but he is finally able to reclaim the Bugle after Osborn is driven underground by temporary insanity. When a duplicate of Spider-Man, created by Mysterio, jumps in front of Jameson's car while he is driving home from work one day, Jameson crashes his car into a tree. He is believed killed in the car crash, dying upon impact, and the media blames Spider-Man for his tragic and untimely demise. Later, he is shown ascending to "the light", only for him to be condemned for all the injustices he committed in life. He is then shown descending into Mysterio's staged version of Hell, where he is tormented by a Spider-Man-themed demon, though this is revealed to just be a part of Mysterio's revenge on Jameson. Eventually Spider-Man rescues Jameson. Jameson's influence on the paper as its publisher is shown in the 2006–2007 Civil War: Front Line when he pressures his staff into supporting the federal government's Superhuman Registration Act, still directing the general tone of the paper, despite losing his more hands-on position. When Spider-Man unmasks and reveals himself to be Peter Parker, Jameson faints in shock at the realization that the man he had been calling a menace had actually been on his payroll for years. On top of the Parker revelation, Jameson is forced to deal with the notion that She-Hulk had now become his daughter-in-law. This was not helped by the fact that She-Hulk and Spider-Man had previously sued him for libel. It has been since revealed that Jameson had always believed that between him and Peter Parker was a bond of trust and he had always regarded him as another son, the "last honest man" in the world; he had always bought his photos, even the ones that he considered inferior, to help him in a discreet manner. After Peter's public confession, Jameson feels so betrayed and humiliated that it shatters their bond. He is determined to make Peter "pay", despite Parker (as enforcer) and Jameson both actively supporting the Superhuman Registration Act. He plans to sue Parker for fraud, demanding back all the money he paid Peter over the years. However, he learns that the government has granted Parker amnesty for all the acts he had done to protect his secret identity, which included taking photos of himself. Both this and his son's marriage to She-Hulk drive Jameson into a fit of rage, and he attacks his new daughter-in-law with the original Spider-Slayer. She easily destroys it, and to smooth things over, remarks that she will handle the lawsuit for fraud against Spider-Man (while privately intending to drag it out as long as possible). Spider-Man later defects from the government's side in enforcing the Registration Act and joins with Captain America's Secret Avengers, openly rebelling against the new law and fighting those attempting to enforce it. Issues of Friendly Neighborhood Spider-Man reveal that Jameson posted a reward to bring in Peter. He also commits libel against Parker by coercing Peter's old girlfriend Debra Whitman into writing an untrue account of him; Betty Brant has secretly supplied information about this to The Daily Globe, which then published a front-page exposé. In the most recent development, Jameson's editor-in-chief and closest friend Robbie Robertson stands up to Jameson and his shoddy treatment of Peter/Spider-Man over the years. Unable or unwilling to admit that he has gone too far in his hatred of Spider-Man, Jameson fires Robertson. Later, Spider-Man learns of this from Betty Brant and decides that he and Jameson should have a long overdue "chat". Some time later, Jameson visits the Robertson house with a bottle of wine, two black eyes, and a broken hand. He tells Robbie that he discovered his office at the Bugle covered with webbing, with a note attached telling him to meet Spider-Man at an old gangster lair. Spider-Man tried to persuade Jameson to rehire Robbie, and Jameson gave him a choice: to have the lawsuit against him dropped, or for Robbie to be rehired. Spider-Man chose the former, revealing that he did so because he believes Jameson only fired Robbie to get a rise out of him. Spider-Man then told Jameson to hit him, as many times as he'd like, to finally work out his frustrations. Jameson was initially reluctant, until Spider-Man started goading him, threatening to inform his wife and son of his "cowardice". Jameson snapped, and started hitting Spider-Man again and again and again, resulting in his broken hand. When it was over, Spider-Man went into the rafters and brought Jameson back a roll of film, containing pictures of their "fight", telling him the photographs depicting him standing back and letting Jameson beat him up would sell "a gazillion copies", and left. Later, at the Bugle, Jameson crushed the film with his foot, not knowing quite why he was doing it. As he turned to leave, Betty Brant accidentally hit him in the face with a door, resulting in his two black eyes. Back in the present, Jameson tells Robbie of his decision to rehire him and to drop the lawsuit against Peter. Jameson has his first heart attack, a mild one, in The Amazing Spider-Man #70, while being threatened by Spider-Man when the latter finally loses his temper after many years of abuse and defamation. In a 2009 storyline, Jameson is elected the Mayor of New York City while Spider-Man is in another dimension with the Fantastic Four, resulting in a month going by on Earth while they are only away for a few hours. In his new office, Jonah receives a visit from his estranged father J. Jonah Jameson Sr. demanding that Jonah cease his vendetta with Spider-Man, citing Spider-Man's many heroic deeds and the fact that the Avengers and even Captain America had accepted him. Spider-Man then enters the mayor's office hoping to establish a truce with him only for Jonah to announce that he has assembled an "Anti-Spider Squad" to capture Spider-Man. Spider-Man responds by taking his superhero work into overdrive, committing heroic deeds all over the city simply to enrage Jameson. Jameson responds by putting his squad on double-shifts, severely straining the city council's budget. In the "Dark Reign" storyline, with Norman's rise to power, Dark Avengers member Spider-Man (really Mac Gargan) seeks to get revenge on Jameson. When Jameson arrived at his home, he was shocked to find a dead stripper on his bed. When Gargan starts a gang war, Jameson goes to Osborn to help and is given "Spider-Man". He later discovers Spider-Man has caused the gang war and tries to confront Norman, though Spider-Man's name is cleared when he appears to save the Big Apple Festival from Bullseye, Daken, and the gangs involved. Jameson's popularity jumps from having worked with Spider-Man to solve the problem, though he does not realize during the course of the events that he is dealing with a different Spider-Man. He also eventually learns that his father is marrying May Parker, something he personally does not like, but in the end he begrudgingly accepts, even offering to pay for their ceremony out of his own pocket, and preside over it. The marriage also technically makes him Peter Parker's brother/cousin, something he very clearly dislikes. Later, Spider-Man tries to stop the Chameleon from setting off a bomb that would kill thousands. Jameson has his squad attack in Mandroid suits. Spider-Man uses his knowledge of the Mandroid suits to disarm the bomb. The squad, instead of following orders and arresting Spider-Man, lets him go. The next day, Jameson is shocked to learn that every member of the squad resigned, and his aide tells him Jonah is getting out of control given Spider-Man's heroics. When Jameson yells about how the public has to see Spider-Man as a menace, the aide snaps that this was not the Daily Bugle. He tenders his own resignation, telling Jameson that he has to choose between Spider-Man or actually helping the city. Jameson later gives a financial bailout to Dexter Bennett to keep the Bugle afloat. This leads to a public backlash, which the villain, Electro, uses to his advantage. Electro espouses taking down the Bugle, a greedy corporation asking for money, and draws energy from his citywide supporters turning on all their electrical appliances. In a showdown with Spider-Man inside the building, Dexter Bennett is crushed by rubble, and the Daily Bugle Building is completely destroyed. The destruction of the Bugle's longtime headquarters proves heartbreaking for Jameson, who is upset with his life's work and all of his memories being destroyed. During Spider-Man's encounter with the latest Vulture in Amazing Spider-Man #623–624, it is falsely stated by a mob boss that Jameson was responsible for his creation in order to get that Vulture to attack Jameson. As a result, Spider-Man fights the Vulture to protect Jameson. Security guard Gabriel Graham, whom Jameson did not even know the name of before, gives up his life to protect Jameson from the Vulture, something that greatly affects Jameson, and makes Peter decide to make a doctored photo showing Jameson trying to fight back against the Vulture. While the picture in fact gets back support for Jameson from the public, and eventually makes several people admit the truth of the situation, Jameson exposes the picture as a fake, and publicly fires Peter Parker, which leads to Peter being blacklisted by every news source. During the "Heroic Age" storyline, J. Jonah Jameson witnesses the reformation of the Avengers. and is later targeted by an assassin called the Extremist. After Spider-Man saves the whole of New York from a bomb planted by Doctor Octopus, Jameson is talked by his son and Steve Rogers into holding a ceremony to give him the key to the city, much to his chagrin. At the same time, he cashes the shares he owned of the DB!, giving the money to Robbie Robertson, so that he can rebuild Front Line into the new Daily Bugle. During the events of the "Big Time" storyline, Alistair Smythe tried to kill J. Jonah Jameson. Marla Jameson jumped in front of him saving his life but died in the process. As he held Marla, Jameson did not blame Spider-Man, but instead blamed himself." During the attacks of the villain Massacre, Jameson comforts a boy named Liam who lost his mother when Massacre attacked the bank she was visiting. Jameson plans to have Alistair Smythe receive the death penalty for what happened to Marla. After Spider-Man defeated Massacre and kept the NYPD from killing him and instead handed him over to the police, Jameson berates Spider-Man for saving the life of a murderer. However, Spider-Man replies that "no one dies". During the "Spider-Island" storyline, J. Jonah Jameson's popularity as the mayor has plummeted and his Anti-Spider-Man Squad is considered to be a huge tax drain. He is shown to have been infected with spider powers  and soon mutates into a spider-like creature where he nearly kills Allistair Smythe, partly due to fact that he was responsible for the death of Jameson's wife. The mayor is eventually cured of the spider-virus, along with the rest of the citizens of New York. During the Ends of the Earth storyline, Mayor Jameson shuts down Horizon Labs (albeit without a court order) on the accusation that it conducts dangerous experiments and harbors criminals such as Morbius where Max Modell's lawyer Hector Baez had to fight the company's accusations. He places the city under martial law with his Anti-Spider-Man Squad patrolling the streets to prevent any looting during the "Ends of the Earth" storyline. However, when Horizon Labs returns as heroes, Jameson is forced to re-open their New York facilities to save face, though he still demands the expulsion of Morbius. After Superior Spider-Man (Doctor Octopus' mind in Spider-Man's body) stops the Sinister Six, Mayor J. Jonah Jameson comes to thank him personally, while Peter Parker's consciousness is shocked to see Jameson's drastically changed attitude towards the hero. On the top of the police station building Jameson, Chief Pratchett and Carlie Cooper stand near to the improvised "Spider-Signal". Jameson boasts about his wise ruling policy while Carlie doubts Superior Spider-Man will ever show up. But he finally does and short-circuits the signal. Jameson discharges oaths about wasted taxpayer dollars, and Superior Spider-Man explains they can hinder him using the signal, humiliating Jameson between the lines. When Massacre rigs the doors of Grand Central Station to explode, this even worries Jameson. While speaking in a press conference, Jameson is suddenly attacked by criminal pranksters Jester and Screwball who assault their victims and broadcast it through the internet in a web-show called "Jested" (similar to popular TV show Punk'd). Both pranksters humiliate Jameson and transmit it all over the world, where even Superior Spider-Man laughs it off. Then he gets summoned by Jameson himself to the City Hall where he asks him to arrest Jester and Screwball. Superior Spider-Man dismisses it at first, but after Jameson reminded him of all the times Superior Spider-Man has pulled pranks on him (and even Otto remembers Peter's quips against him), he agrees to catch them putting his Patrol App on course. Superior Spider-Man beats up Jester and Screwball where his brutality being watched all over the city including Jameson (who is enjoying the punishment). Jameson argues with his father about the actions of Superior Spider-Man. Jameson later enlists Superior Spider-Man to help oversee the execution of Alistair Smythe. Jameson arrives to the Raft for a final inspection before Smythe's execution, where he has told that all of the Raft's inmates will be transferred once Jameson shuts it down, highlighting the infirmary where Boomerang, Vulture and Scorpion are being attended. Jameson, alongside Superior Spider-Man, his assistant Glory Grant and Bugle reporter Norah Jones, watch the procedure of Smythe's execution, while he claims to be a "better person"
Jameson reflecting on the moment whose Smythe killed his wife Marla right in front on him, sadly proclaiming that he will not keep the promise to fulfill her dying wish until Smythe dies, swearing that he will not leave the island. After Smythe's escape, Jameson, Glory Grant, Norah Winters, and the remaining civilians are surrounded by Superior Spider-Man's Spider-Bots and then are informed by Otto (in a pre-recorded holgoram) that he has taken measures to counteract any attempt of escape so his Spider-Bots will safeguard them in a force field while the reinforcements arrive, but Jonah refuses to stand still inside the force field, willing to go and help Superior Spider-Man against Smythe. When Smythe has the upper hand over Superior Spider-Man, Jameson poses as a prison guard to narrowly shoot Smythe. Superior Spider-Man accuses Jameson of leaving the force field, but Jameson confronts Superior Spider-Man to tell him he brought him to ensure that Smythe gets executed by any means necessary, implying that he has giving permission to Superior Spider-Man to directly kill him. Superior Spider-Man accepts and tells Jameson to go back to the force field with the others. Smythe sends Scorpion to target Jameson. Jameson is assaulted by Scorpion who was more than willing to kill him only to be stopped by the Lizard. Once aboard the rescue boat, Jameson prepares himself for a press conference musing that he will be happy once the Raft is destroyed. Superior Spider-Man sways him apart and tells him that he should give him the Raft for his new base of operations. Jameson refuses only to be blackmailed by Superior Spider-Man with a recording of their meeting at the Raft where Jameson grants permission to Superior Spider-Man to kill Smythe. Fearing the repercussions (and in the process reigniting his hatred towards Superior Spider-Man), Jameson agrees and makes the announcement in his press conference where he publicly gives Superior Spider-Man the Raft as his new Super Hero Headquarters which Superior Spider-Man rechristens it as "Spider-Island II". During the attacks of the Goblin King's Goblin Underground, Mayor Jameson unveils the Goblin-Slayers (which Mary Jane thinks might be former Spider-Slayers) which he plans to use to combat the Goblin threat. Jameson orders to send one of the Goblin Slayers to the robbery location and then head to chase Superior Spider-Man. His Spider-Slayers confront Superior Spider-Man as Spider-Slayers with Jameson's face projected on the front faceplate. Jameson replies that he is done with being blackmailed by him and does not care if Jameson loses everything as long as he can finally bring down Superior Spider-Man, but his Spider-Slayers are reactivated by Green Goblin and voice rings out declaring that he has taken control of the Spider-Slayers as Green Goblin comments that Norman Osborn now runs this city. In New York City Hall, Jameson is coming under heavy fire for the fact that his Spider-Slayers have turned against the people. He tries to blame Alchemax, but his accusations are swiftly rebuked by Liz Allan who appears via video link declares that Alchemax is severing all ties with Jameson. Jameson shows his frustration for his personal downfall after the Spider Slayers' failure, but Tiberius Stone uses this as a chance to sell them as weapons to other nations. In the aftermath, Spider-Man is restored to his body Octavius sacrificing his own mind to bring Peter back as he recognizes that Peter Parker is the true Spider-Man and Green Goblin's plan is thwarted, Spider-Man visiting Jameson's office to confront him after what happened and returns him the Spider-Bot that Doctor Octopus used to record his blackmail material. Jameson replies that he will not accept it since he would not believe whatever Spider-Man says, regarding him now as a "monster" that does not own up to the consequences of his actions and instead stomps on others. Spider-Man replies that he will not expect him to believe this but says that he should not fear him, and should not take the blame for everything that Green Goblin caused, but to stay and fight. Once Spider-Man leaves, Jameson reveals that he had already resigned his post as Mayor of New York City and leaves the office, promising that from now on he will kick back. During the Original Sin storyline, the eye of the murdered Uatu the Watcher revealed that J. Jonah Jameson had fired a former Daily Bugle employee for viewing an embarrassing article that he wrote in which he praised Spider-Man in his early days of being a wrestler. Jameson later established the Fact Channel. As Silk battles against Electro and Spider-Man deals with Black Cat, Jameson remains on the channel forcing the cameraman to film the action. Black Cat deviate one of Electro's bolts hitting Spider-Man, knocking him down in the process. Black Cat attempts to unmask Spider-Man as Jameson (who hears the truth concerning Doctor Octopus) aims the camera. However, Jameson's angle prevents anyone seeing Spider-Man's face long enough for Silk to knock Black Cat back and Spider-Man to put his mask back on. He would later be seen taking charge of the Fact Channel's operations acting like he was head of the company and taking interest in Silk. Following Regent's defeat and Betty Brant's exposé, Jameson brags to Glory Grant that their days at the Daily Bugle was when real journalism had happened. Jameson and Peter Parker later got word that his estranged father Jay coughed up blood and collapsed. While visiting his father in a private room at Mount Sinai Hospital at the start of the Dead No More: The Clone Conspiracy storyline, Jameson accuses Peter where their traveling around the world might have caused him to catch some type of disease. Jay calms his son down. Jameson was visited by the doctor of New U Technologies upon being called in by his father's doctor. Jameson suspects that there is a "price" for this and storms off. Later on, Jameson visits New U Technologies to speak to the doctor. In order to give proof to Jameson that their talents of using a subject's DNA to clone replacement parts work, Jameson is surprised when the doctor calls in an apparent revived Marla Jameson. With his father's health having taken a turn for the worse, Peter has to endure Jameson's and May's concerns for his extreme skepticism for using New U, with his secret identity preventing him from informing them of the real reason he doubts them. Peter remains adamant of sticking to the conventional procedure and Jay has sided with him. Peter's superheroic endeavors prevent him from accompanying May and Jameson as Jay's health reaches critical status and he undergoes conventional surgery. To make matters worse, this is not enough and Jay passes away. It is revealed that the revived Marla Jameson is a clone that the Jackal had gathered to grow clones with false memories that span all the way to their deaths. Later, Jameson was granted a revived clone of Mattie Franklin. When Jameson wants one of his workers to investigate the New U scenario in San Francisco, Cindy volunteers to go to get away from the city as Hector Cervantez (now calling himself Spectro) accompanies her. Jameson is enthusiastic for her that her family is back together and leaves for dinner, but Cindy found something off about his behavior. Cindy's suspicions are confirmed when she finds Jameson talking with his formerly-deceased wife while Spectro finds a room with a number of test subjects in capsules. Cindy is then approached in her apartment by Jameson. Cindy gives him Rafferty and Lola's research to voice skepticism on the New U Technologies and Jameson invites her to join him on a quick trip to the facility. He tells Cindy that he believes they are doing good work and introduces her to Mattie and Marla. After J. Jonah Jameson is taken to Haven with his clone wife, he asked the Jackal to revive his father. Jackal told him to head upstairs in order to promote New U Technologies on television. When Jameson is about to send out a broadcast message of the New U Technologies, Jackal reactivated the broadcast to tell the world that they will all die and be reborn as the Carrion Virus in all of the clones and causes them to start rapidly decaying. Jameson's broadcast causes the Carrion Virus to start spreading worldwide. Spider-Man and Anna Maria Marconi arrive to stop the broadcast as Mattie reveals to Jameson her superpowers. After Spider-Man sends out the Webware Emergency Signal, Jameson and Silk find Marla and Mattie reduced to dust. Following the Carrion Virus being thwarted, Jameson is heartbroken as Spider-Man and Anna arrive. Jameson pleads to Spider-Man not to tell Peter that he was right about his suspicion towards New U Technologies. Afterwards, Jameson clean his office after he is fired by the Fact Channel. During the Secret Empire storyline, J. Jonah Jameson was in Manhattan at the time when Baron Helmut Zemo used the Darkhold to amplify Blackout's powers to surround the city in Darkforce following Hydra's takeover of the United States. When Kraven the Hunter raided the Daily Bugle looking for information on the identity of Spider-Man, Phil Sheldon's daughter Jennie ran to warn Jameson thinking that he could be in danger. When Jameson was attacked by Kraven the Hunter, Jennie Sheldon fired a signal flare into the sky enough to attract the attention of Spider-Woman who defeated Kraven the Hunter. Following a tense confrontation with Spider-Man provoked by a rogue branch of S.H.I.E.L.D., Spider-Man agreed to an exclusive interview with Jameson that culminated in the wall-crawler revealing his secret identity, prompting Jameson to vow to be more supportive of the hero's efforts in future. Jameson is later abducted by Norman Osborn in order to find out who Spider-Man is. Osborn takes a brief interval from the torture to kill Phil Urich as the self-proclaimed Goblin King tried to raid one of his old storehouses. After Osborn suited up as the Green Goblin, Jameson informed the villain that he could not stop Spider-Man since Gwen Stacy's death. Those words made Norman remember that Spider-Man is Peter Parker, breaking the mental block on Spider-Man's identity. This left Jameson devastated at what he has done. Jameson into helping defend Spider-Man's inner circle against Osborn, who has bonded himself with the Carnage symbiote to become the Red Goblin. Jameson sends Venom to defend Mary Jane at the Stark Tower. Jameson and Superior Octopus later help to defend Aunt May from Red Goblin where Jameson operates an older version of the Spider-Slayer. When Spider-Man removes the Carnage symbiote from Green Goblin, Spider-Man persuades Jameson not to shoot him. David Burnoll - The stepfather of J. Jonah Jameson. Later revealed to be also his paternal uncle. J. Jonah Jameson, Sr. - The estranged father of J. Jonah Jameson. He later becomes married to Aunt May. In The Clone Conspiracy storyline, Jay later died in the hospital. Joan Jameson - The first wife of J. Jonah Jameson. John Jameson - The son of J. Jonah Jameson who works as an astronaut. Marla Madison - The second wife of J. Jonah Jameson. She was later killed by Alistair Smythe. Peter Parker - Step-cousin of J. Jonah Jameson. May Parker - Step-mother of J. Jonah Jameson. In 1602: New World, the sequel to Marvel 1602, Jameson is an Irish colonist and friend of Ananias Dare. He prints the Roanoke Colony's newspaper, The Daily Trumpet, with the assistance of Peter Parquagh, whom he orders to learn more about the mysterious "Spider", believing him to be a threat to the colony. In the alternate reality of Earth X, everyone on Earth has been affected by the Terrigen Mists, granting everyone superpowers. Jameson is turned into a humanoid donkey (a human body with an equine head). It is also revealed that after he published information exposing Peter Parker as Spider-Man, his reputation was ruined, as no one trusted a man who had spent years paying the very hero he called a menace, and the Daily Bugle has gone bankrupt. He has captured Jack Russell (Werewolf by Night) in the old Bugle offices and brings him food, presumably having mistaken Russell for his son John, the Man-Wolf. In the original Marvel universe of G.I. Joe, Jameson is seen hassling a news vendor for the seeming lack of any Daily Bugle papers. In the "House of M" reality created by the insane Scarlet Witch and in which mutants are dominant over baseline humans, Jameson is the maltreated publicist of Peter Parker, here a celebrity without a secret identity. Despising Peter and only keeping his job for the pay, Jameson gets his chance to completely ruin his boss when the Green Goblin gives him Peter's old journal. Learning that Peter is a mutate instead of a mutant, Jameson reveals this to the populace of the world, who come to hate Peter for having only pretended to be a mutant. He is left grieving and guilt-ridden when Spider-Man appears to have killed himself. In the MC2 continuity, an alternate future of the mainstream Marvel Universe, Jonah is still the publisher of The Daily Bugle. His wife, Marla is still alive. He hires May Parker, the daughter of Peter, as a photographer. Ironically, he is very supportive of Spider-Girl, in contrast to his stance on her father (in the MC2 continuity, Spider-Man's identity was never made public). He also supported "Project Human Fly", another attempt to create a superhero, this time in response to the death of Joseph "Robbie" Robertson at the hands of Doctor Octopus. When "Buzz" Bannon, the intended subject of Project Human Fly, is murdered and the suit stolen, he immediately condemns The Buzz, the identity assumed by the person who stole the suit. However, he is unaware that his own grandson, Jack "J.J." Jameson and The Buzz are one and the same person. In the Marvel Knights four-issue series Spider-Man: Reign, set 35 years in the future, an elderly Jameson is seen returning to a totalitarian New York, with the mission of convincing a middle age Peter Parker to return as Spider-Man to save the city from being enclosed by Mayor Waters' WEBB security system. After attacking Reign officers, he is saved by the newly returned Spider-Man. Jonah next rounds up groups of children to join his cause to save the city, as they print about Spider-Man's return. Eventually Jonah is captured by the Reign and brought to the mayor's office, where he confirms his suspicions, finding out that Venom is behind the WEBB project as a means of trapping the citizens of New York, so that they can be fed on by itself and other symbiotes. After Spider-Man defeats Venom, and destroys the WEBB, Jonah is seen on television proclaiming that freedom has returned to the city. In Spider-Man Noir, Jameson remains the owner of the Daily Bugle. However, he's seemingly under the thumb of Norman Osborn, the "Goblin" and kills Ben Urich to prevent him from publishing evidence against Goblin. It is soon revealed that this was in fact the Chameleon, who abducted Jameson for the Goblin. Jonah was saved by Spider-Man from being eaten by Kraven's Siberian tiger. Issue #1 of Spider-Man: Fairy Tales follows the fairy tale of Little Red Riding Hood. Mary Jane takes the part of Little Red Riding Hood, and Peter is one of the woodsmen. Jameson is the leader of the woodsmen, who also include Osborn and Flash Thompson. In Spider-Verse, Jameson was giving Peter Parker a call in order to demand that he go to Armstrong Park in order to take a picture of a new villain that had just appeared. This reality has humans living on the moon. In another reality, Jameson's wife, Marla was saved from Alistair Smythe by the Spider-Man version of Ben Reilly. The article that followed said event as well as the newspaper itself had a positive story about how the Spider-Man version of Ben Reilly in that reality was a true hero. On Earth-65, J. Jonah Jameson is the Mayor of New York City. He held a press conference against Spider-Woman after she presumably killed Peter Parker. In Marvel 2099 on an alternate unnamed reality, an aged J Jonah Jameson was apparently alive in the year 2099 where he was the new CEO of Alchemax. He is responsible for passage of the Anti-Powers Act which calls for the forcible arrest and depowering of all non-conforming superpower individuals. Eventually, it is revealed that he is a shape-shifting Skrull operative who was fully brainwashed into believing he was Jameson. In Ultimate Spider-Man and Ultimate Comics: Spider-Man, Jameson is essentially the same character as the original version, although younger in appearance. Jameson decries Spider-Man and other vigilantes, accusing them of being fraudulent hero figures in contrast to his astronaut son, who was killed during a mission. While Jameson does not necessarily hate Spider-Man, he has no qualms about painting him in a negative light to sell papers. And despite his adverse attitude towards Spider-Man, this version of Jonah still ends up unwittingly hiring Peter Parker to work at the Daily Bugle as its webmaster. [volume & issue needed] During the "Ultimatum" storyline, Jameson drops his vendetta against Spider-Man after losing his wife in a massive flood that engulfs Manhattan and later witnessing Spider-Man rescuing other flood victims. Feeling ashamed and regretful of his smear campaign, Jameson vows to dedicate his life towards portraying Spider-Man as the hero he really is, and begins by publishing several pro-Spider-Man stories Ben Urich held onto. [volume & issue needed] Subsequently, Jameson deduces Spider-Man's true identity, but following the trauma of being kidnapped, along with Spider-Man, by the Chameleons, and being shot in the head, Jameson comes to believe that it is his God-given duty to protect and aid Spider-Man. After the death of Peter Parker, and the assumption of his mantle by the second Spider-Man, Miles Morales, Jameson, when told by investigative reporter Betty Brant that she has discovered his secret identity (though she incorrectly concludes that Morales' father, Jefferson Davis, is Spider-Man), Jameson refuses to publish her theory, explaining that doing so would not illuminate any truth for the benefit of readers, but would only ruin a family's life and deprive the city of another hero. The 1960s animated series contained the most negative depiction of the character, voiced by Paul Kligman. He is an egotistical, greedy, narcissistic, cowardly, blustering, skinflint, loudmouth who constantly berates his employees Peter Parker and Betty Brant, and automatically accuses Spider-Man of any crime, even when the evidence clearly contradicts him. He is implied to have some psychic ability in one episode, where the Green Goblin tries using him as a medium for a demon-summoning. He is constantly against Spider-Man, for example in the episode "Farewell Performance" where he wants an old Castle Theater to be torn down, but when Spider-Man claims he agrees with old buildings being torn down, Jameson says the Daily Bugle will now try to preserve old buildings, which is what Spider-Man wanted. He makes a feature for magic in his paper when he is sent free tickets by Blackwell the Magician, showing his spitefulness. In the episodes "Never Step On A Scoripion" and "Sting of the Scorpion", he makes out that he saved the employees, despite cowering the entire time, and helping create Scorpion in the first place as a weapon to hunt down Spider-Man. In the episode "The Witchin' Hour", Jameson is looking at a picture of the Green Goblin committing a crime and automatically assumes Spider-Man has merely gotten a new costume, claiming he'd "Know that menace anywhere." In the second-season prequel episode "King Pinned" (which followed up the episode "The Origin of Spider-Man"), Jameson's attitude toward Spider-Man is portrayed as warmer, even going as far as helping Spider-Man defeat Kingpin and expose a drug counterfeiting racket during their first meeting. Not openly hostile, Jameson seems to be more surprised that Spider-Man actually exists. He is also brave enough to be willing to stand up to the Kingpin, referring to him as a 'fat slob of a racketeer' and 'big tub of lard', and refusing to submit to Kingpin's threats and intimidation. Earlier in the episode, Jameson gives Peter a job at the Bugle when he remembers that Peter is the nephew of the late Uncle Ben, calling it his good deed for the day. In the third season, he goes back to blaming Spider-Man for every crime. The character's first live-action appearances were in 1970s The Amazing Spider-Man TV series, performed by David White in the television film and Robert F. Simon in the subsequent television series. In both these incarnations, J. Jonah Jameson's abrasive, flamboyant personality was toned down and the character was portrayed as a more avuncular figure. J. Jonah Jameson appeared in the 1981 Spider-Man series, voiced by William Woodson. William Woodson reprised his role of J. Jonah Jameson in the Spider-Man and His Amazing Friends episodes "The Origin of Iceman", "Spider-Man: Unmasked" and "The Origin of the Spider-Friends". J. Jonah Jameson appears in the 1990s Spider-Man animated series voiced by Edward Asner (the casting may have been inspired by his well-known role as another fictional news editor). In this series, the character's dislike of Spider-Man is based less on his powers and deeds, and more to his hiding his identity behind a mask as his wife was killed by a masked gunman in this continuity. The series also portrays his integrity as a journalist, refusing to cover up the truth even when it is in his best interests and portrays his loyalty to those who work for him. Examples of the earlier include firing Eddie Brock when John Jameson confirms Spider-Man's version of who stole a mineral John and a fellow astronaut brought from an asteroid and publishing an article on chemical weapons being developed by Oscorp despite being one of its shareholders and board members on this series. He secretly hired attorney Matt Murdock when Peter Parker was framed by Richard Fisk and personally uncovered evidence exonerating Robbie when he was framed by Tombstone. The character's cigar-smoking trademark is not featured in the more recent animated TV series of the show. In "Farewell Spider-Man," the J. Jonah Jameson of the high-tech Spider-Man's reality does not hate Spider-Man and is depicted as Peter Parker's godfather. J. Jonah Jameson appears in the pilot episode of Spider-Man Unlimited, voiced by Richard Newman. He and Peter attend the space shuttle launch of his son, John Jameson. When John's spacecraft is seemingly destroyed, Jameson blames Spiderman, along with Venom and Carnage. J. Jonah Jameson appears in MTV's Spider-Man series voiced by Keith Carradine. Here, he is portrayed as extremely cheap and his hatred of Spider-Man only being evident in the show's series finale. J. Jonah Jameson appears in The Spectacular Spider-Man, voiced by Daran Norris. This version sports a soul patch along with his trademark mustache (that together form an exclamation point) and displays a level of hyperactivity not seen in any of his previous incarnations, as well as an obsession with time, punctuality and deadlines similar to J. K. Simmons's portrayal of the character. Aside from that, he retains his dislike for Spider-Man from the comics and takes delight in anything that might discredit or defame him. He also describes Spider-Man as a menace and a vigilante in addition to retaining much of his cynical, avuncular attitude and brusque manner with his staff. He also tends to be boisterous and difficult to get along with, though his secretary Betty Brant seems unfazed by his bloviating. Although he considers Spider-Man a menace (if at least a photo-worthy one), he seems to be fond of Peter Parker as he suggests tomato juice to the boy to kill the stench of garbage on him after a photo shoot in a junkyard and protects him from the Rhino by bravely covering for him while he can escape. When he learns that Aunt May had a heart attack during the Sinister Six's attack on Broadway, he says he will tell Peter the news. He also blames Spider-Man for the sudden profusion of costumed psychopaths like Doctor Octopus, Green Goblin, and the Rhino in New York City (though this assumption is actually proven correct in the episode "The Invisible Hand" when Tombstone reveals that at least some of the super-villains were specifically created to occupy Spider-Man so that more ordinary criminals can continue their activities unhindered). At one point, he calls for the headline 'Spider-Man: Threat or Menace?'. In the second season, his hatred of Spider-Man gets worse. After his son John is affected by spores that hitched a ride in the symbiote and made him grow and having super strength and leaping tall bounds, Jonah convinces his son to be a superhero and take Spider-Man down. The spores then take over John's mind making him violent and aggressive. After Spider-Man gets rid of the spores with electricity, Jonah then witnesses his son craving the spores powers and he blames Spider-Man for destroying his son. When Venom (Eddie Brock) reveals Parker's identity to Spider-Man, Jonah hardly believes it although he still wants to make sure. At Valentines Day, his wife Joan Jameson makes him go to an opera even though he does not want to. After making an excuse to his wife to leave the stage, he witnesses the battle of the crime lords Tombstone, Doctor Octopus and Silvermane just as Jameson ironically made an excuse to leave the opera. After Spider-Man stops them and reveals Tombstone as the Big Man, Jameson accuses Spider-Man of assaulting an outstanding citizen, but Frederick Foswell dismisses this to him by whispering in his ear. Jameson angrily responds by saying "Never mind." After Norman Osborn tests the Vault security by putting Spider-Man in there, Jameson gloats about it. After Spider-Man manages to escape the Vault, Jameson claims Spider-Man and all the villains are working together so they can raise his blood pressure. J. Jonah Jameson appears in Ultimate Spider-Man, voiced by J.K. Simmons reprising his portrayal from the first live-action Spider-Man film series. Much like his Ultimate counterpart, he defaces and mistrusts masked vigilantes much to Spider-Man's dismay. He runs the news network Daily Bugle Communications. In his first two appearances "Great Power" and "Great Responsibility", he stated that there will be a warrant for Spider-Man's arrest. He is seen at the end of "Great Responsibility" reporting the battle that Spider-Man, Power Man, White Tiger, Iron Fist and Nova has against the Frightful Four. In the episode "Exclusive", Mary Jane Watson follows Spider-Man for an exclusive interview in order to sell the footage for a contest held by the Daily Bugle. Although Mary Jane did not win the contest following Hulk's fight with Zzzax, Jameson does mail Mary Jane a new camera. In the episode "Beetle Mania", Jameson is being targeted by the Beetle for a starts making a campaign to expose him to which Spider-Man and his team entering the Daily Bugle to stop Beetle's assassination attempts. After Beetle is defeated by Spider-Man's team and learns Jameson is not in his office but on monitor renderings, Mary Jane unplugs the monitor after she comes for the interviews. In the episode "Out of Damage Control", Jameson sends one of his people out to record Spider-Man's team helping Damage Control clean up the area that was trashed in the fight against the Wrecking Crew which he broadcasts. After Spider-Man's team and Damage Control CEO Mac Porter defeats the Wrecking Crew which was also taped, Jameson appears on the nearby television monitor stated that Spider-Man's victory over the Wrecking Crew still does not prove anything. In the episode "Spidah-Man! ", Jameson puts out a $10,000,000.000 bounty on the apprehension and unmasking of Spider-Man. Near the end of the episode, Jameson rescinds the bounty on Spider-Man claiming that the ratings of his broadcast going down "had nothing to do with Spider-Man being in Boston because only Manhattan can tolerate Spider-Man". In the episode "The Man-Wolf", Jameson calls upon S.H.I.E.L.D. director Nick Fury to arrange a rescue party to look for his son John Jameson. After John was rescued, Jameson mentioned in his broadcast that he blames Spider-Man for his son's Man-Wolf transformations. When Jameson asks Nick Fury what he is going to do about it, Fury states to Jameson that his son was rescued because of Spider-Man. Before ending his transmission with Jameson, Nick Fury tells him to "put that info in his moustache and chew on it." In the episode "Sandman Returns", Jameson reports on Spider-Man working with Sandman where Jameson making some negative comments on Sandman causing him to go on a rampage. In the episode "Agent Venom", Jameson comments about people's opinions about Spider-Man changing after he had worked with the Avengers. The "Spider-Verse" episodes featured alternate versions of J. Jonah Jameson that are also voiced by J.K. Simmons. In the episode "Spider-Verse" Part 1, the 2099 version of Jameson does his broadcast through a hologram where he reports on Spider-Man 2099. The gender-swapped reality's version of J. Jonah Jameson is an older lady named J. Joanna Jameson who reports on Spider-Girl. In the episode "Spider-Verse" Part 2, the Noir version of J. Jonah Jameson is shown as a picture with his voice being heard in his radio broadcasts. In Spider-Ham's reality, J. Jonah Jackal appears where his ranting on Spider-Ham caused Spider-Ham to temporary quit the superhero business. In the episode "Spider-Verse" Part 3, a medieval reality's version of J. Jonah Jameson is a town crier (referred to in the closed captioning and credits as "J. Jonas James' Son") who rants about Spyder-Knight while telling the people to pay the Alchemist for protection. The Ultimate Marvel version of J. Jonah Jameson is seen where he still thinks that Spider-Man is a menace with the current Spider-Man being Miles Morales. J. Jonah Jameson appeared in The Avengers: Earth's Mightiest Heroes, voiced again by J.K. Simmons. In the episode "Along Came a Spider...", Tony Stark visits Jameson trying to tell him that the 'Captain America' that appeared on television was a Skrull in disguise. It made clear that various high-level individuals have told him this including the President, but he "still" disbelieves them and has been calling Captain America a traitor. During the conversation, Stark points out that Jameson has been running campaign against Spider-Man similar to what he has now doing to Captain America for years. Jameson suggests to Tony that he should take Betty Brant and Peter Parker to get proof of Captain America's innocence. Jameson later has the Daily Bugle print out a story about Captain America saving people from Spider-Man and the Serpent Society which lead to Spider-Man to go "web his mouth shut." J. Jonah Jameson appears in Avengers Assemble, again voiced by J.K. Simmons. In the episode "The Avengers Protocol", he reports on the Avengers fight with each other on the grounds of Avengers Mansion when they were taken over by MODOK's microbots. In the episode "Hyperion", Jameson reports on Hyperion's heroic activities. When Hyperion starts fighting the Avengers, Jameson reports on this action stating that Hyperion had the right message, but is the wrong messenger. After the Avengers defeated Hyperion, Jameson later stated that Hyperion was not a superhero. J. Jonah Jameson appears in Hulk and the Agents of S.M.A.S.H., voiced once again by J.K. Simmons. In the episode "Doorway to Destruction" Pt. 1 when Rick Jones talks about Jameson's talks about the Hulk, Rick tries to dub his voice so that Jameson can say nice things about Hulk. In the episode "The Collector", Jameson compares Spider-Man and Hulk as menaces until Hulk breaks the television during the Agents of S.M.A.S.H. 's poker match against Thing. In the episode "All About Ego", Jameson reports on the approach of Ego the Living Planet and that S.H.I.E.L.D. says that there is nothing to worry about. Jameson then reports that the end is near as Ego continues to approach Earth. After Ego the Living Planet was repelled, Jameson states that 'Spider-Man's plot' was stopped. In the episode "Monsters No More", Jameson reports on the Agents of S.M.A.S.H. helping the Fantastic Four to stop the Tribbitites from invading Earth. When Leader's Agents of C.R.A.S.H. attack Vista Verde wearing adamantium-made stealth belts in a plot to discredit the Agents of S.M.A.S.H., Jameson withdraws his praise on them while mentioning how they are "attacking" Vista Verde. In the episode "Fear Itself", Jameson reports on the Agents of S.M.A.S.H. 's disappearance. When he commented about where they are, Jameson states "Who cares?" In the episode "Spidey, I Blew Up the Dinosaur", Jameson reports that Spider-Man and the Agents of S.M.A.S.H. have "unleashed" Devil Dinosaur on Manhattan. The "Days of Future Smash" episodes featured alternate timeline versions of J. Jonah Jameson that are also voiced by J.K. Simmons. In the episode "Days of Future Smash: The Dino Era", the dinosaur-dominated timeline featured a dinosaur version of Jameson named J. Jonah Jamesasaurus who reported on Spider-Raptor's activities. In the episode "Days of Future Smash: Dracula", the Vampire-dominated timeline featured a vampire Jameson who reports to all humans to let themselves be converted into vampires. In the episode "Days of Future Smash: The Hydra Years", the Hydra-dominated timeline featured a version of Jameson who reports a messages to Leader (who is the leader of Hydra). J. Jonah Jameson appears in Lego Marvel Super Heroes: Maximum Overload, voiced once more by J.K. Simmons. J. Jonah Jameson appears in the second season of Marvel's Spider-Man voiced by Bob Joles. He first appears in "How I Thwipped My Summer Vacation" where he gets mad at Eddie Brock for not providing the good quality footage of Spider-Man. Thanks to Randy calling a favor from his father, Peter Parker applies for a job at the Daily Bugle. In the episode "Take Two," Peter provides Jameson with the footage of Spider-Man fighting the Wild Pack much to the anger of Eddie Brock. Jameson is pleased with the footage and has Betty Brant give Peter a check. Later on, Peter sees footage of Spider-Man with Jameson criticizing Spider-Man. In the episode "Venom Returns", Jameson is among the people that are abducted by Venom and he even fired Eddie when he unmasked himself as Venom. During this time, he considered Miles Morales's version of Spider-Man a third-rate menace-in-training. When Spider-Man fights Venom at Horizon High, he is unmasked in front of a still-trapped Jameson as Miles shows up posing as Spider-Man. After the sonic weapon places both the Venom symbiote and Eddie in a coma, Peter told Jameson that he was hired by Spider-Man to provide a diversion for Venom. Jameson fires Peter for working for Spider-Man in his plot and putting innocence in danger as Jameson storms off much to Peter's dismay. In the aborted James Cameron's script; Jameson is a TV executive instead of editor-in-chief of the Daily Bugle. J.K. Simmons as J. Jonah Jameson in the Spider-Man film series. In the Spider-Man films directed by Sam Raimi, J. Jonah Jameson is portrayed by J.K. Simmons, and serves as a major source of comic relief. Portrayed as a blustering, bombastic, obsessed, hyperactive man, the film version of Jameson retains his dislike for Spider-Man, and takes delight in anything that might discredit or defame him. In the first film Spider-Man, Jameson describes him as a menace and a vigilante, and points out, "Then why does he wear a mask? Huh? What's he got to hide?" Indeed, the only reason he develops an interest in publishing news on the hero is because it sells papers, and upon hearing that no one has been able to get a clear shot of him, he declares, "He doesn't want to be famous? Then I'll make him infamous!" He also retains much of his cynical, avuncular attitude and brusque manner with his staff, though he willingly protects Peter Parker when the Green Goblin demands to know the identity of Spider-Man's photographer. When Peter accuses him of slandering Spider-Man, Jameson says, "I resent that! Slander is spoken. In print, it's libel." He holds the dubious honor of providing the nicknames for the central villains in both of the first two films: the Green Goblin and Doctor Octopus, wanting his staff to immediately trademark the name. In each film his office is rearranged and relocated; only the first movie offers an explicit reason for this, as in that film it is partially destroyed by the Green Goblin. In Spider-Man 2, throughout the film, Jameson is shown to know that Spider-Man is a hero, but is too proud to admit it. He even goes so far as to admit it when crime and danger skyrocket and his son's fiancée, Mary Jane Watson, is kidnapped after Spider-Man temporarily disappears; true to form, he recants almost immediately and becomes infuriated with the web-slinger once again when Spider-Man steals back his costume from the Bugle to confront the rampaging Doctor Octopus. The Spider-Man 2.1 extended cut of the film contains a short scene in which Jameson dons the Spider-Man suit and romps around on his desk, while Robbie Robertson, Betty Brant, and Hoffman watch in a mix of surprise and confusion. Mrs. Jameson is alive and well in the films, being mentioned in the first and third films and seen in the second. At the wedding of his son John Jameson and Mary Jane Watson, once it becomes clear that the bride had left the groom at the altar, the first thing Jameson does is tell his wife to call the wedding caterer and "tell her not to open the caviar" after having evidently lost an earlier argument where he did not wish to buy caviar at all. In Spider-Man 3, Jameson sets Eddie Brock and Peter Parker up as rivals to earn a staff job, instructing them to obtain unflattering pictures of Spider-Man. He is shown to supposedly have many medical conditions, being warned by Miss Brant (who was informed by Jameson's wife) whenever he is too tense or when he needs to take his pills. Specifically, it is revealed that he has high blood pressure, and Miss Brant must always remind him to watch his temper. Later, Jameson fires Brock for doctoring and selling fake photos of Spider-Man robbing a bank, in spite of his dislike of the hero, as Brock's photo destroyed his paper's reputation, which has not printed a retraction in 20 years. He is surprised by Parker's new confident and aggressive demeanor, provoked by the black suit, especially when he finds him and Miss Brant flirting on his desk, exclaiming "Miss Brant, that's not the position I hired you for". At the climactic battle between Spider-Man, New Goblin, Sandman and Venom, Jameson, unable to locate Parker, bargains with a little girl in the crowd to obtain her camera to shoot the battle himself. She refuses to sell for less than a hundred dollars. After the stingy Jameson reluctantly pays, he discovers that there is no film in the camera, to which she explains, "The film's extra", much to his fury. While Jameson does not have a physical presence in The Amazing Spider-Man 2, it is established that Peter Parker is working for him by providing him with photographs of Spider-Man, and that Jameson is still slandering him. At one point, Peter emails Jameson to ask him to take it easy on Spider-Man, but Jameson immediately responds with a refusal. The 1967 TV series version of J. Jonah Jameson appears in Spider-Man: Into the Spider-Verse, voiced by Stan Lee. He appears in a post-credit scene at the time when Spider-Man 2099 visits his 1967 counterpart. He appears in 2000's Spider-Man video game, voiced by Dee Bradley Baker. Scorpion tries to kill Jameson for his part in creating him. Spider-Man saves Jameson and defeats Scorpion in battle. Jameson later tells two S.W.A.T. cops to shoot down and kill Spider-Man. Spider-Man escapes by jumping out of a window. Though Jameson does not make an appearance in Spider-Man 2: Enter Electro, the Daily Bugle continues to print false stories about Spider-Man working with the same villains he is fighting to stop, likely on Jameson's orders. When Spider-Man finally defeats Electro, the Bugle credits Thor with the victory. J. Jonah Jameson appears in Xbox version of the 2002 Spider-Man video game, voiced by Jay Gordon. He tells Peter Parker to get photos at the zoo of a flaming spider, resulting in a confrontation with Kraven the Hunter. Jay Gordon reprises his role of J. Jonah Jameson in Spider-Man 2. He initially supports Quentin Beck's claims that Spider-Man is a fraud, but accuses the two of being in cahoots when it is revealed that Beck is Mysterio. J. Jonah Jameson appears in Spider-Man 3, voiced by J.K. Simmons. He is an employer of Peter Parker as in the films and comics, giving him various photography missions to complete. He is captured by Luke Carlyle and thrown out of a helicopter in midair with an electric necklace on. Spider-Man catches Jameson, and has to keep up with the helicopter to stop Jameson getting electrocuted. After rescuing Jameson and removing the collar, Jameson reluctantly thanks Spider-Man for saving his life, possibly the only time in any media he has done so. Later in the game, Jameson hires both Parker and Eddie Brock to take photographs of Spider-Man in his new black suit, doing criminal activities. While the character never actually appears in the Marvel: Ultimate Alliance games, he is mentioned in Marvel: Ultimate Alliance on a VS simulation disc where the heroes fight Scorpion and in Marvel: Ultimate Alliance 2 during a special conversation if the player chooses anti-registration for Spider-Man, to which Maria Hill says that "he's just made J. Jonah Jameson a very happy man". In Marvel Super Heroes, Spider-Man's victory pose has him photographing himself standing over his fallen opponent and saying "One for J.J.". In Marvel Super Heroes vs. Street Fighter, he appears alongside Robbie Robertson if Spider-Man is one of the fighters in the "Night-Cooking" game show stage. In Marvel vs. Capcom, Spider-Man's victory pose has him posing for a picture with his partner, stating "I know Jameson will use this picture to make me look like a bad guy." There are also various winning quotes where he mentions "J.J.J.". In Marvel vs. Capcom 3: Fate of Two Worlds, Spider-Man has an updated version of the aforementioned victory pose in which he says "That's why J.J. pays me the big bucks!" The Daily Bugle is a playable stage with Jameson appearing in the background in a helicopter where he shouts at the fighters, and also appears in Spider-Man's ending in Arcade mode where he claims to Peter Parker that Spider-Man defeating Galactus is a hoax and that he was actually in cahoots with him the entire time. In Marvel vs. Capcom: Infinite, Jameson appears on the monitor in the background of the New Metro City stage. He is featured on a news channel seen debating with mayor Mike Haggar. During the second time in the city in the Sega game The Amazing Spider-Man vs. The Kingpin, J. Jonah Jameson follows the player around bad-mouthing him. J. Jonah Jameson appears in the Spider-Man pinball machine by Stern Pinball. J.K. Simmons also recorded additional lines of custom speech appropriate for a pinball game, such as "Extra ball", "Jackpot" and "Hey, kid, you just won a free game." J. Jonah Jameson appears in the PlayStation 2 and PSP version of Spider-Man: Web of Shadows, voiced by Daran Norris. He has been captured by Spencer Smythe and A.I.M. so that Spencer can clone him and use that clone to discredit J. Jonah Jameson and Spider-Man. J. Jonah Jameson appears in Spider-Man: Edge of Time, voiced by Fred Tatasciore. In the intro cutscene, he criticizes Spider-Man loudly in front of Peter Parker, mockingly stating that the people soon would put out a musical in his honor. When Walker Sloan changes the timeline to start Alchemax in the 1970s, Jameson becomes a controversial late-night TV news anchor. J. Jonah Jameson appears in Lego Marvel Super Heroes, voiced by John DiMaggio. The Daily Bugle get wrecked during Captain America and Mister Fantastic's fight with Doctor Octopus as J. Jonah Jameson tries calling out for Peter Parker to get his pictures unaware that Peter has changed into Spider-Man to help fight Doc Ock. In a bonus mission, J. Jonah Jameson is present in the Daily Bugle at the time when Phil Coulson was overseeing Doctor Octopus' community service of repairing the parts of the Daily Bugle that was damaged during the aforementioned fight as Jameson tells them what to do. He also threatens to lock Doc Ock up and expose Phil as a S.H.I.E.L.D agent if they do not clean up the mess. After the bonus mission is complete, Deadpool narrated that Jameson rewarded Doc Ock and Phil with a "50%" (actually 4%) subscription to the Daily Bugle. J. Jonah Jameson appears in The Amazing Spider-Man 2 video game voiced again by Fred Tatasciore. J. Jonah Jameson appears in Disney Infinity 2.0: Marvel Super Heroes, voiced by Kyle Hebert. J. Jonah Jameson appears in Spider-Man Unlimited, voiced again by Kyle Hebert. He appears as a non-playable character. A mutated version of Jameson from the Spider-Island storyline appears as a playable character. J. Jonah Jameson appears in Marvel Heroes, voiced again by Kyle Hebert. J. Jonah Jameson appears in the 2018 Spider-Man video game, voiced by Darin de Paul. Following on from the prequel novel, he has left the Daily Bugle and begun his own podcast called "Just the Facts with J. Jonah Jameson." Here he takes the role of a conspiracy theorist, airing own uncensored, unsubstantiated, personal views on what he feels is wrong with the city. These usually tie back to Spider-Man in some way such as blaming him for the chaotic fallout from Kingpin's arrest and that he was in fact in league with the Sinister Six. Another podcast reveals Mac Gargan has filed a lawsuit against the publisher for his role in turning Gargan into the Scorpion. In "The Heist" DLC, J. Jonah Jameson talks about the Maggia and their plans to fill the power vacuum left by the arrest of Kingpin and Mister Negative. In The Simpsons episode "Moe'N'a Lisa", which aired on November 19, 2006, J.K. Simmons guest stars, playing a publisher resembling J. Jonah Jameson in the Spider-Man films. This resemblance is made more apparent when he demands pictures, stories, and even poems about Spider-Man. He even repeats a line from Spider-Man 3: "What are you waiting for? Chinese New Year?" This is due in part to guest star Michael Chabon's script work on Spider-Man 2. A similar character, also voiced by Simmons, appears later in the same season as the publisher of The Springfield Inquisitor in the episode "Homerazzi". In the Spider-Man 2 parody on VH1's ILL-Ustrated, J. Jonah Jameson is portrayed as a Dr. Dre look-alike. A parody of J. Jonah Jameson mostly based on J.K. Simmons's performance appears in Superhero Movie. This parody is a mental patient from the hospital that the newspaper company shares with, yelling that hamburgers can tell the future. J.K. Simmons reprises his role of J. Jonah Jameson in the Robot Chicken episode "Gimme That Chocolate Milk." He is seen at a press conference revolving around the Santa Fe High School shooting. After April O'Neil speaks about asking if they can have the Teenage Mutant Ninja Turtles in the area, J. Jonah Jameson demands that the mayor has Spider-Man arrested. The second sketch has Peter Parker giving J. Jonah Jameson the latest picture of Spider-Man as it is shown that J. Jonah Jameson has a room filled with Spider-Man's pictures and shown to secretly like him. Reference is made to Jameson in the novelization of the Fantastic Four movie, although the character is not expressly named as Jameson; after they have saved the people on a bridge, Mister Fantastic is shown on numerous television channels talking about the Fantastic Four, and recognizes a man with a small mustache (accompanied by a headline FANTASTIC FOUR: HEROES OR MENACE) as the owner of a major newspaper. Jameson is also featured in the 1978 novel Mayhem in Manhattan, written by Len Wein and Marv Wolfman. Jameson features in the prequel novel to the 2018 video game, Spider-Man: Hostile Takeover. Having retired from the Daily Bugle some time ago, he is convinced to launch a radio segment by Echo, which the latter plans to use to help turn the public's opinion against Spider-Man. Jameson is aware that the funding Echo provides is coming via Kingpin, and following Kingpin's own public fall from grace, immediately cuts all ties. He subsequently states he plans to launch his own independent podcast. Michael Mulheren plays J. Jonah Jameson in the Broadway musical Spider-Man: Turn Off the Dark. ^ "J. Jonah Jameson". Comic Vine. ^ Conan, Neal (October 27, 2010). "Stan Lee, Mastermind Of The Marvel Universe". NPR. ^ a b Trumbull, John (September 2016). "J. Jonah Jameson: Hero or Menace?". Back Issue! (91): 37–41. ^ a b c d Trumbull, John (September 2016). "J. Jonah Jameson: Spidey's Most Persistent Foe?". Back Issue! (91): 29–35. ^ Zdarsky, Chip (w), Walsh, Michael (a), Herring, Ian (col), VC's Travis Lanham (let), Allison Stock, Devin Lewis, Nick Lowe (ed). "My Dinner with Jonah" Peter Parker: The Spectacular Spider-Man v3, 6 (January 2018), Marvel Worldwide, Inc.
^ "Why the Dollar is Worth So Much Less Than It Used to be". ^ "Of Civil Wars and Sidekicks: Jenkins Talks CIVIL WAR: FRONT LINE and SIDEKICK". Comic Book Resources. Retrieved March 22, 2006. ^ Slott, Dan (w), Delperdang, Jesse; Eaglesham, Dale; Kitson, Barry (a), "'Nuff Said! ", Amazing Spider-Man #591. June 2009. Marvel Comics. ^ Amazing Spider-Man #800. Marvel Comics. ^ G.I.Joe A Real American Hero #95 (December 1989). Marvel Comics. ^ Bendis, Brian Michael. Ultimate Comics: Spider-Man #15. Marvel Comics. ^ Truitt, Brian (August 2, 2011). "Half-black, half-Hispanic Spider-Man revealed". USA Today. Archived from the original on August 20, 2011. ^ Bendis, Brian Michael (w), Marquez, David (a). Ultimate Comics: Spider-Man #16.1. December 2012. Marvel Comics. ^ Trumbull, John (September 2016). "What If? Starring J. Jonah Jameson". Back Issue! (91): 36. ^ "What If J. Jonah Jameson Adopted Spider-Man?" What If? (vol 2) #82. Marvel Comics. ^ "Comics Continuum by Rob Allstetter: Wednesday, January 30, 2008". ^ "'Marvel's Spider-Man' Returns to XD with Hour-Long Premiere in June". 2018-05-23. ^ "Spider-Man Scriptment by James Cameron". ^ "Review of James Cameron's Spider-Man Scriptment". ^ a b "James Cameron was this close to making a Spider-Man movie". 2017-07-15. ^ Chitwood, Scott (February 15, 2000). "Review of James Cameron's Spider-Man Scriptment". IGN. Archived from the original on August 23, 2011. Retrieved April 28, 2007. ^ "EventHubs fighting game news, guides, streams, videos - Street Fighter, Marvel vs. Capcom, Super Smash Bros., Tekken". ^ "Galactus Lands in New LEGO Marvel Super Heroes Trailer - Marvel Heroes Games - News - Marvel.com". ^ "Spider-Man's J. Jonah Jameson finds his true calling as a blustering right-wing podcaster". ^ a b David Liss (2018). Marvel's Spider-Man: Hostile Takeover. Titan Books. ^ Flynn, Kevin (August 10, 2011). "All the Editors That Are Fit to Spoof". The New York Times.